In large bowl, beat sugars, butter, vanilla and egg with electric mixer on medium speed, or mix with spoon. Stir in flour, baking soda and salt (dough will be stiff). Stir in nuts and chocolate chips. On ungreased cookie sheet, drop dough by rounded tablespoonfuls about 2 inches apart. Bake 8 to 10 minutes or until light brown (centers will be soft). Cool 1 to 2 minutes; remove from cookie sheet to wire rack. For 5 grams of fat and 90 calories per serving, decrease butter to 3/4 cup and omit nuts. 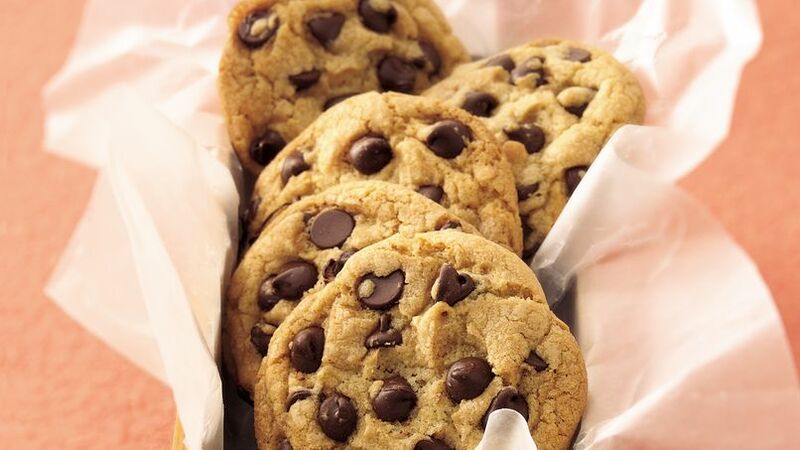 Substitute 1 cup miniature semisweet chocolate chips for the 12-oz bag of chocolate chips. Substitute 2 cups candy-coated chocolate candies for the chocolate chips. Press dough in ungreased 13x9-inch pan. Bake 15 to 20 minutes or until golden brown. Cool in pan on wire rack. 48 bars. Drop dough by 1/4 cupfuls or #16 cookie/ice-cream scoop about 3 inches apart onto ungreased cookie sheet. Bake 12 to 15 minutes or until edges are set (centers will be soft). Cool 1 to 2 minutes; remove from cookie sheet to wire rack. 1 1/2 dozen cookies. This cookie is flat because the butter was too soft or partially melted, flour was undermeasured or the cookie sheet was too hot. This cookie is slightly rounded and evenly golden brown; there are no problems. This cookie didn’t change shape and is hard because too much flour was used.